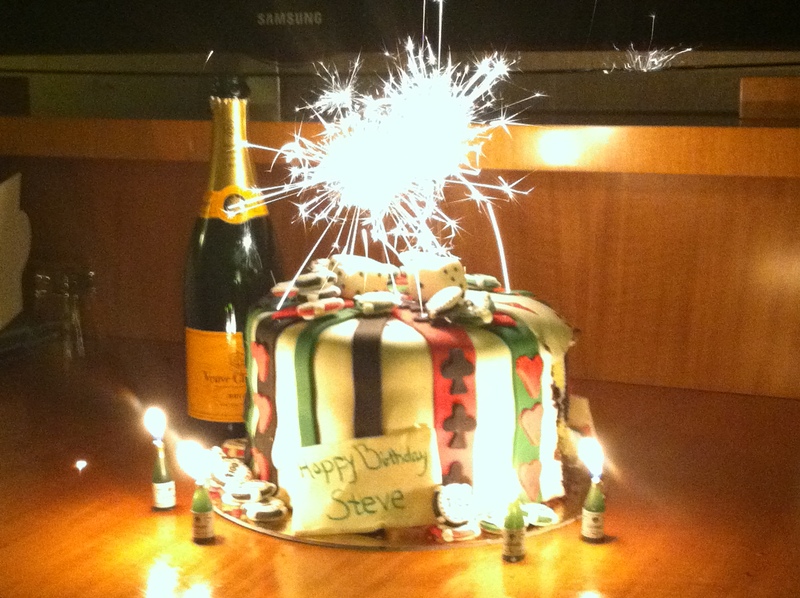 Well, the celebration was this weekend and now I can officially share with you my adventures of creating the “Poker Cake”! We’re going to take this one in stages because there’s a lot of different parts. The party was on Saturday and luckily I happened to take Friday off of work and was able to really put the time and effort into the cake that it deserved. I baked the cakes Thursday to let them cool overnight and then spent the day Friday frosting and decorating. 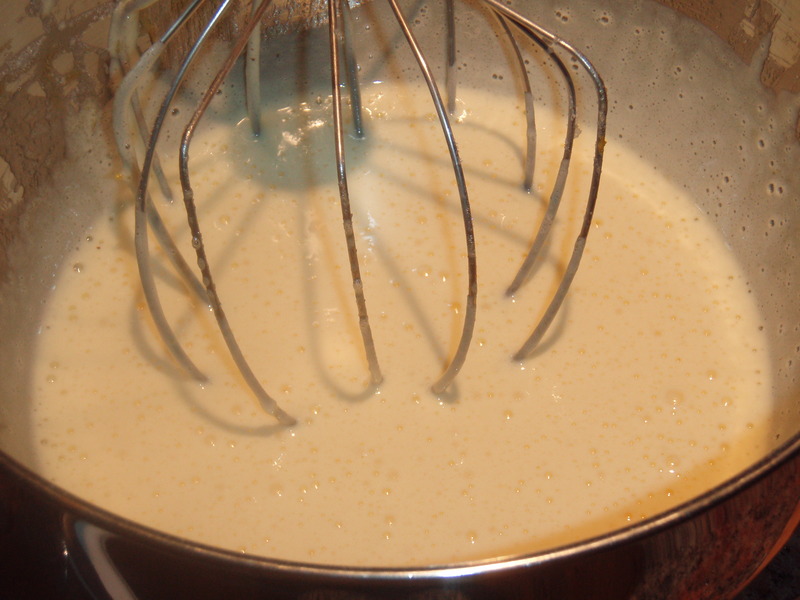 In another small bowl, whisk together the buttermilk and vanilla. Set aside. In a medium bowl, combine the chopped chocolate, 1/4 cup of cocoa powder and hot water and set the bowl over a pot of simmering water (Double boiler method). Make sure the water does not touch the bottom of the bowl because the differences in heat will disrupt the melting. 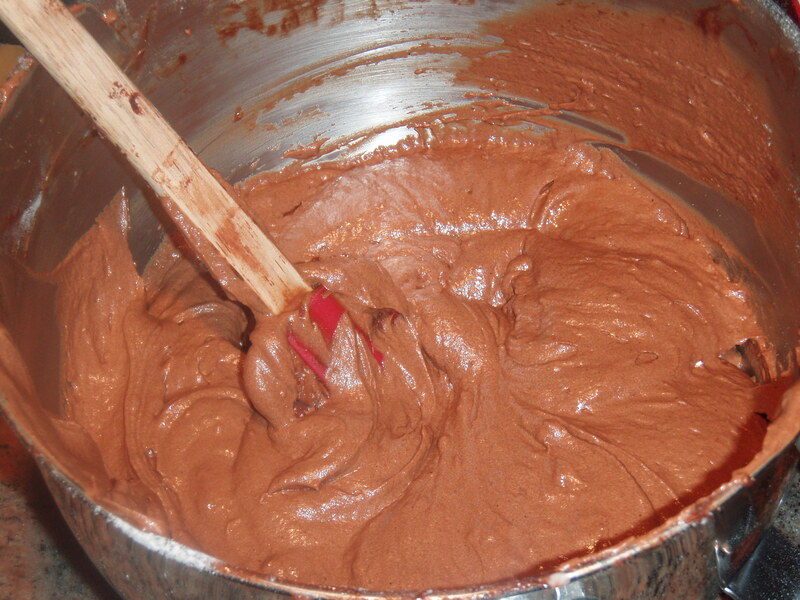 Heat the mixture, whisking often, until the chocolate is melted and the mixture is smooth. The mixture will be on the thicker side and that is what you want. Stir in 1/2 cup of sugar and continue to heat until thick and glossy, 1 to 2 minutes. Remove the bowl from the heat and set aside to cool. There are many recipes for chocolate cake that call for just simply melting the chocolate and mixing it into the batter, but this one is different in that it creates a “pudding” of chocolate, cocoa powder, water and sugar. 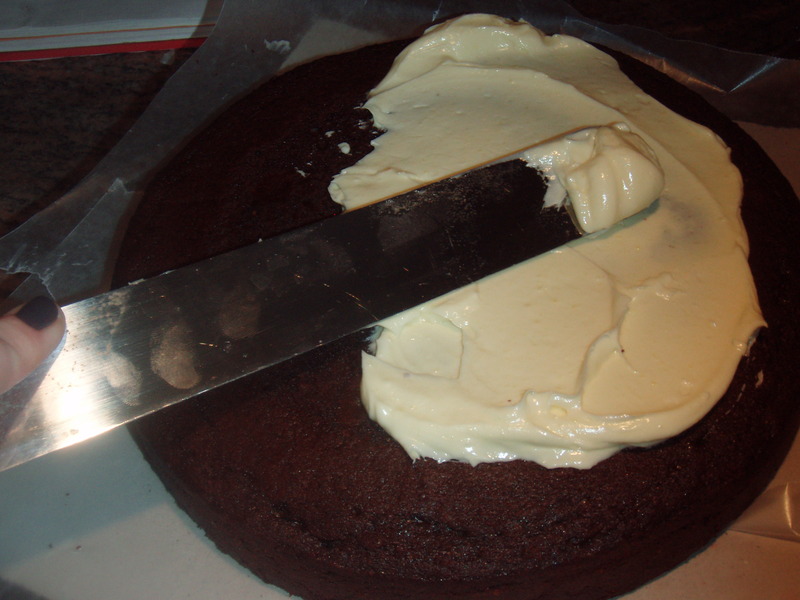 This produces an incredibly moist cake with a very strong chocolate flavor and rick brown color. As we know, I’m a chocolate lover! The more chocolate the better and when Cora asked me to bake this cake she said that Steve loves peanut butter and chocolate, so I figured if I’m going to go chocolate, I might as well go all the way! 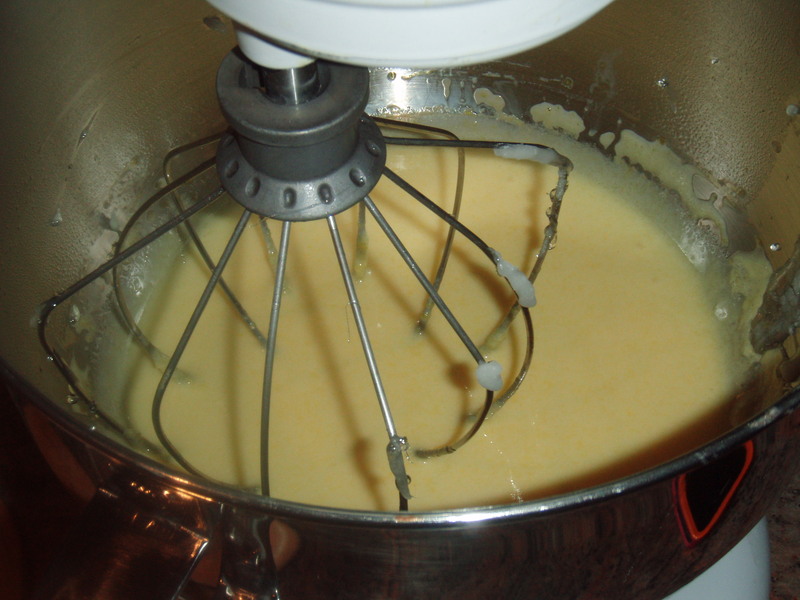 In a large bowl whip together (with the whisk attachment) the eggs and egg yolks on medium-high speed. 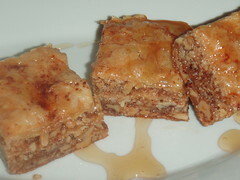 Gradually add in the remaining 1 1/4 cups of sugar and continue to whip until the mixture is very thick, 4 to 8 minutes. Make sure to scrape the sides and bottom of the bowl since the whisk attachment can’t reach the very bottom. 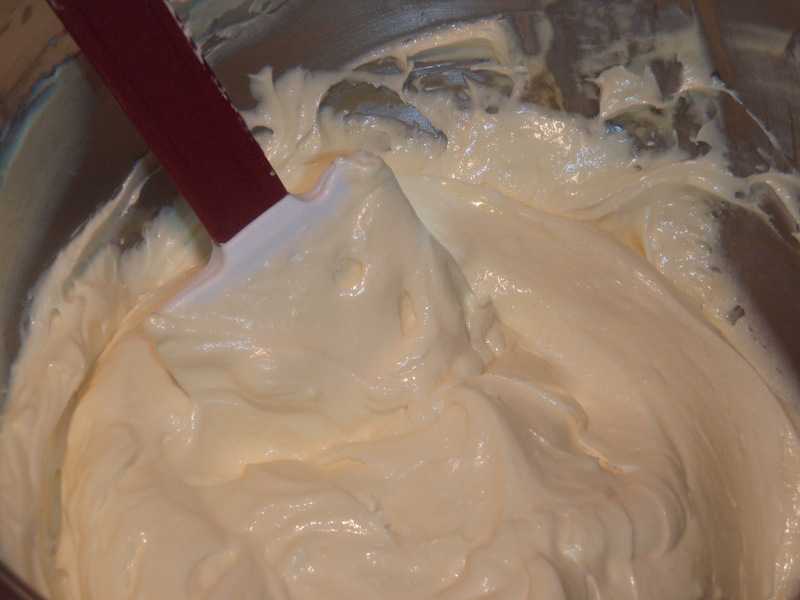 You’ll notice also the change in color the longer you whip the mixture together. It should finish with a very light cream color versus the yellow you started with. 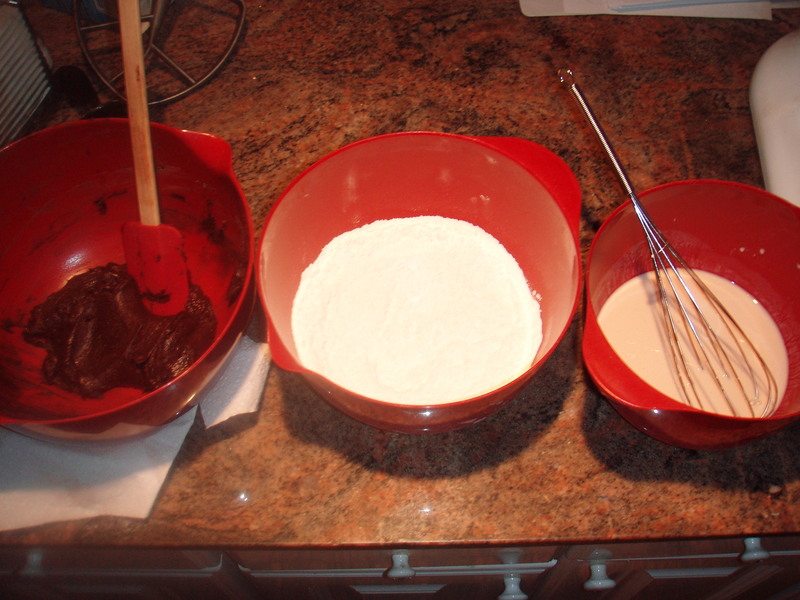 If you’re using a standing mixture, switch out the whisk attachment for the paddle attachment. Beat the cooled chocolate mixture into the egg-sugar mixture on medium speed until thoroughly incorporated. You’ll be able to tell if the chocolate mixture has cooled by simply feeling the bottom of the bowl and making sure that it is not still hot from the double boiler. Beat in the butter, one peace at a time on medium speed until incorporated. Reduce the mixer to low-speed and beat in 1/3 of the flour mixture, followed by 1/2 the buttermilk mixture. Repeat with 1/2 of the remaining flour mixture and the remaining buttermilk. Take the bowl off the standing mixture and fold in the remaining flour mixture with a rubber spatula until it is just incorporated. 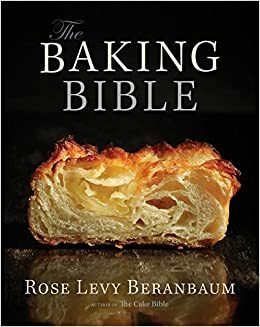 I like to do this part by hand because I find that folding the last of the flour in keeps the airiness and lightness of the batter and creates a fluffier cake. Scrape the batter evenly between the prepared pans, smooth the tops and gently tap the pans on the counter to settle the batter. Bake the cakes for roughly 30 minutes or until a toothpick inserted in the center comes out with a few crumbs attached. Make sure to also rotate the pans halfway though baking. Let the cakes cool in the pans for 10 minutes then run a small knife around the edge of the cakes and flip them onto a wire rake. Peel off the parchment paper, flip the cakes right side up and let cool COMPLETELY before frosting, about 2 hours minimum. 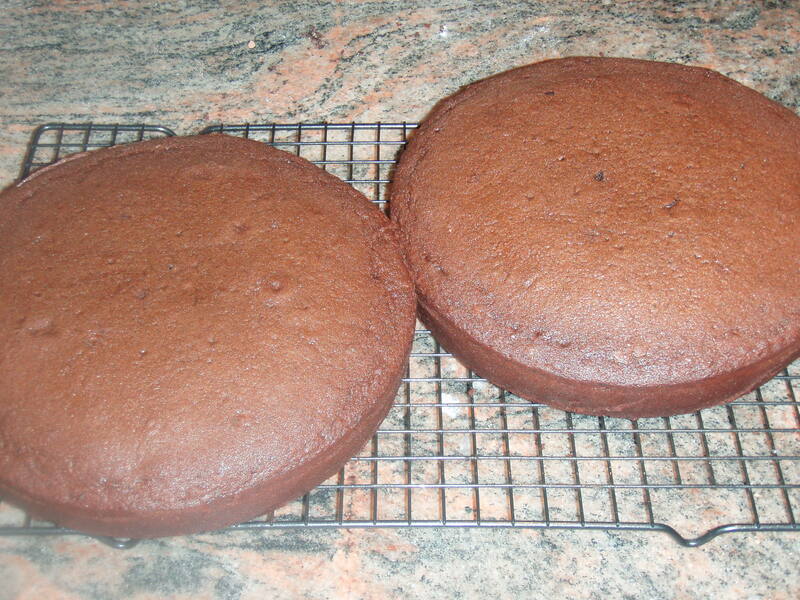 It is very important to have patience when letting your cakes cool before you frost them. If they are not completely cooled the frosting can heat too much and melt all over the cake, the cake can come apart easier and create crumbles in the frosting and several other problems. Long story short, I’ve made this mistake 1 too many times and at this point I’d rather be safe than sorry. 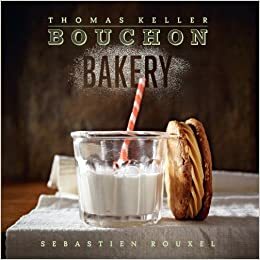 In a medium-sized pot, before placing on the heat, combine the sugar with the water and stir with a wooden spoon until the mixture resembles the consistency of wet sand. Using a wet pastry brush, clean all the sugar crystals from the sides to prevent the sugar syrup from crystallizing during cooking. Place the pot over medium heat and cook, without stirring, for roughly 10 minutes or until the syrup reaches 166 degrees C (240 degrees F). The stirring will cause crystallization so it is important that the syrup cooks undisturbed. While the syrup is cooking you can prepare the Pate a bombe. 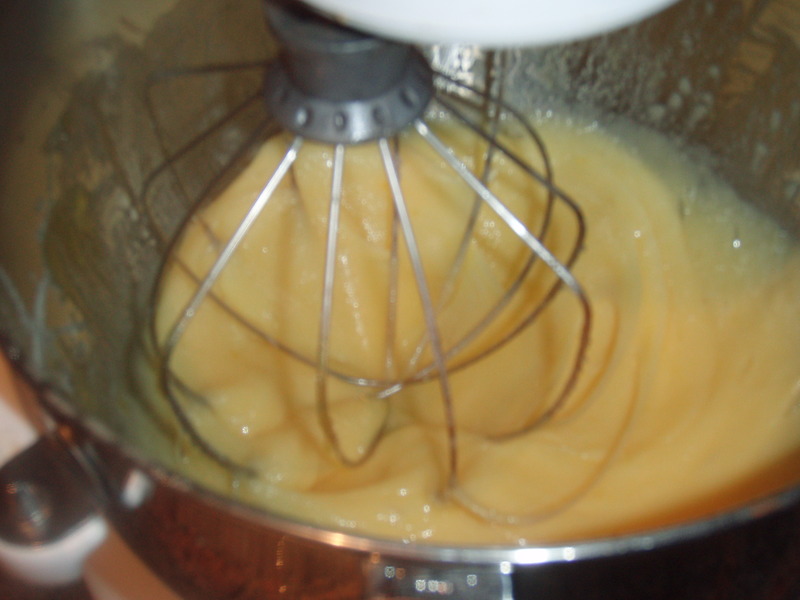 Combine the egg yolks and egg in the bowl of a standing mixer fitted with the whisk attachment. Beat on low-speed to blend and then increase to medium until thick and pale yellow. 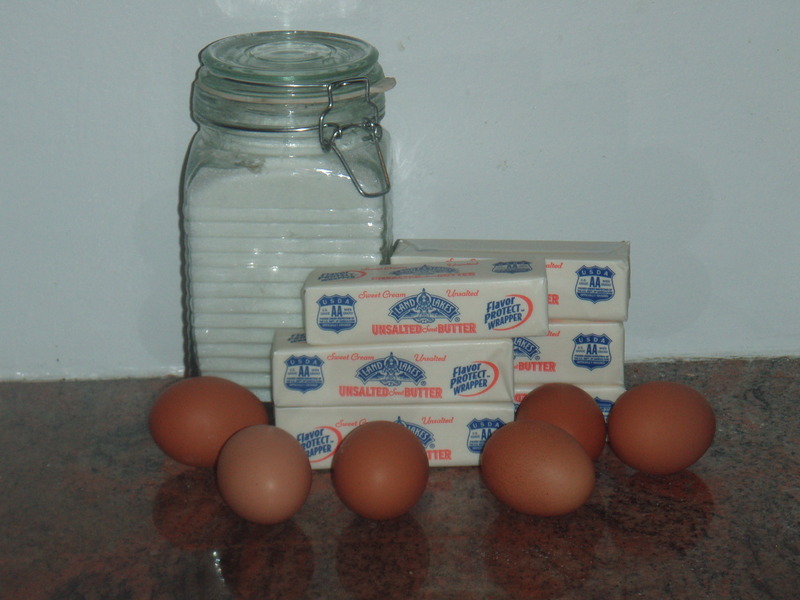 This will take several minutes and since the eggs cannot be over whipped this is something you can start before you prepare the syrup if needed. As soon as the syrup reaches the 166 degrees C, carefully and slowly pour the hot syrup down the sides of the bowl with the whipped eggs while the motor is still running. Be sure not to let the syrup hit the whisk or it may splatter and burn your skin. Beat the mixture for several minutes until the bottom of the bowl is cool to the touch. The mixture will be very smooth and thick. 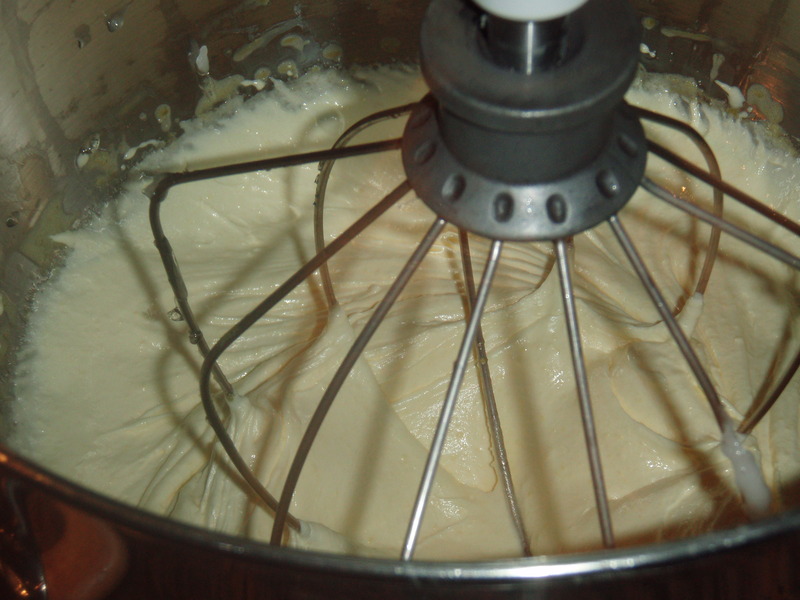 Once completely cooled, remove the whisk attachment and replace it with the paddle. Add the butter slowly (1 tablespoon at a time)and beat until all of it has been incorporated and is very smooth. Once all the butter is incorporated you are free to add any flavoring you’d like. 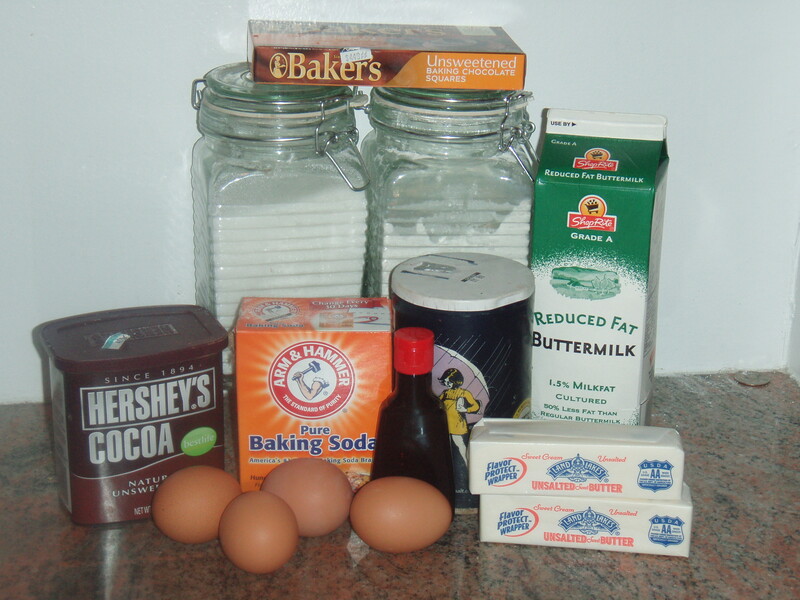 The Buttercream frosting can be stored in an airtight container for up to 2 weeks in the refrigerator, or up to 1 month in the freezer. Steve’s cake is going to be a 3 layer chocolate cake with buttercream frosting that I am going to cover in fondant and decorate. When it comes to assembling a layer cake, choosing the cake for each layer is very important. 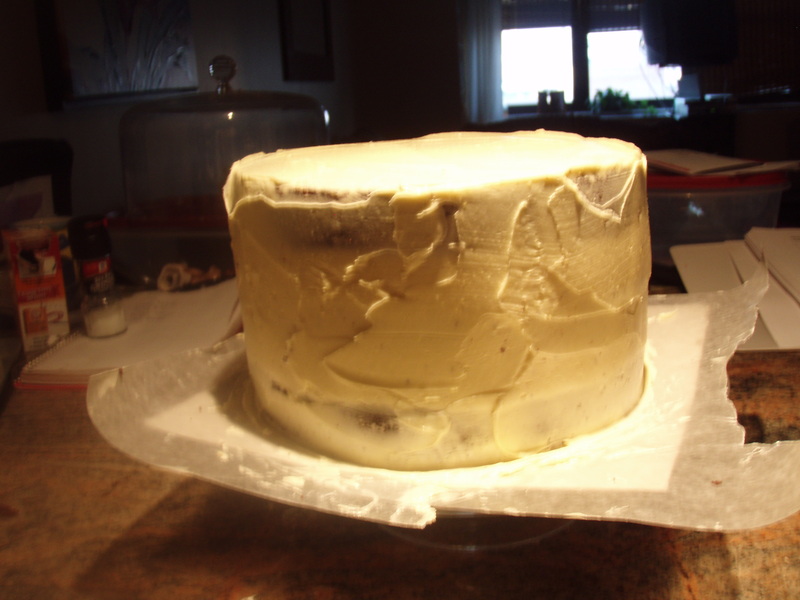 The 1st layer (bottom layer) needs to be structured, the 2nd layer (middle layer) can have some flaws and should be the “least attractive” cake and the top later should have a smooth bottom (when the top layer is added you will be adding it upside down to get a clean edge look). Scoop up a portion of the buttercream and place it in the center of the bottom layer. Smooth it out evenly and add more if need be. Place the second layer directly on top and repeat. 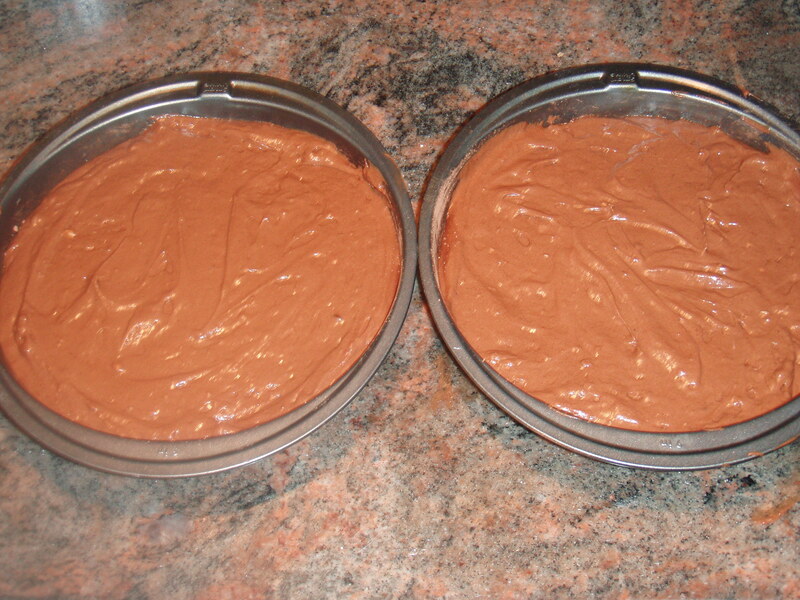 Place the top layer upside down directly on top of the second layer, but rather than frost the top of this piece, you will frost the sides of the whole cake first followed by the top. Create as smooth a surface as you can. This could very well be the last step of your cake. If so, be sure to apply enough buttercream to fully cover the cake. 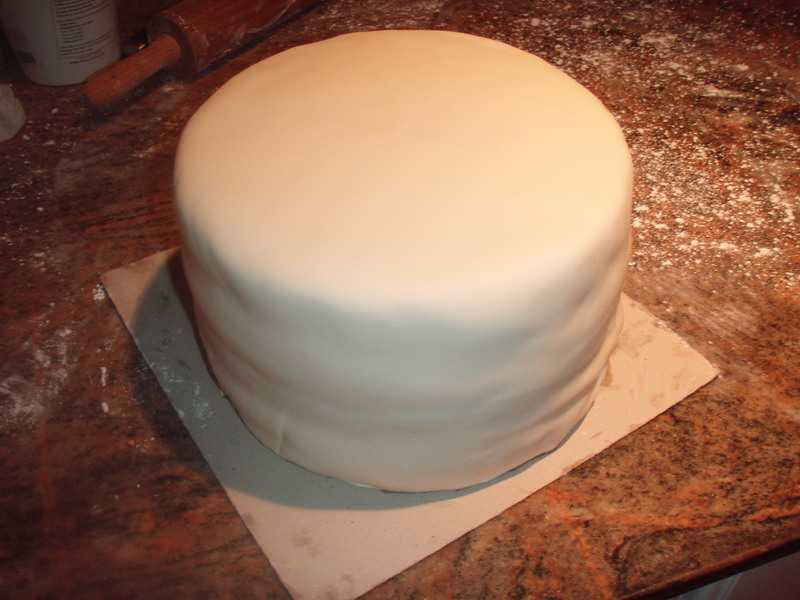 If you will be covering the cake in fondant you will only want to use a very thin layer of buttercream so that when the fondant is applied the excess will not come out the bottom and you will get a smooth surface. Fondant can be very tricky to work with. You need to be gentle, have patience and take your time. Be sure to cover your work surface with confectioner’s sugar then, using a fondant roller or rolling-pin, roll out the fondant to the diameter you’re looking for. Make sure to roll out a big enough circle to fully cover the cake, but do not roll it out too thin or it will begin to crack. 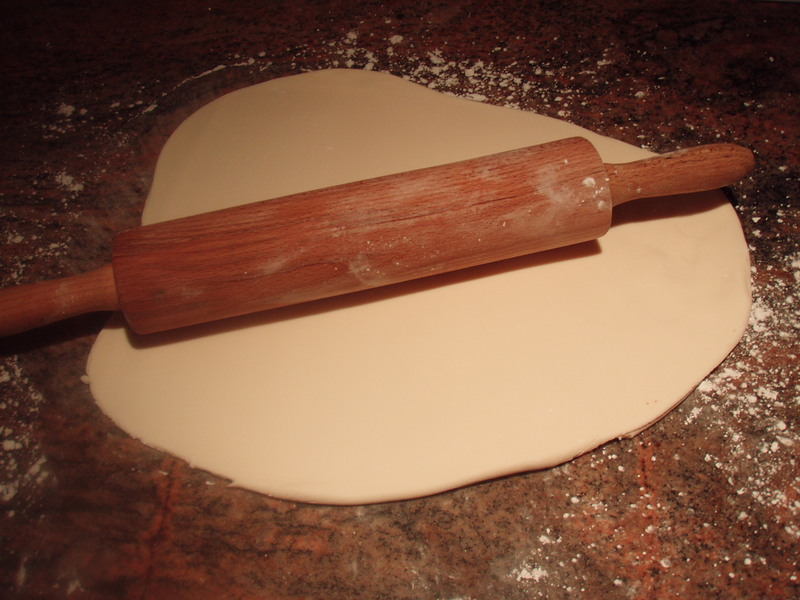 Roll the fondant onto the rolling-pin and unroll it onto the cake. Smooth the top and down the sides. Work with it a bit to smooth the edges and cut the excess with a sharp knife or pizza cutter. 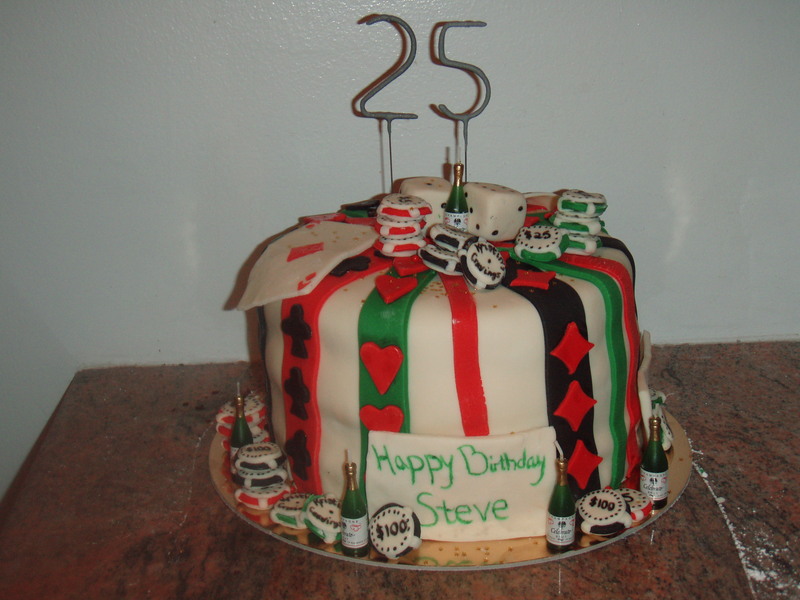 As you know, Steve’s cake is poker themed so I used red, black and green fondant to create stripes, hearts, diamonds, spades, poker chips, etc.. But this is where your creativity comes into play. Think of this as a blank canvas. You can create anything and that’s where everything gets interesting! This great site is a walk-through for those details it suited you about this and didn’t know whom to ask. Take a look here, and you will absolutely find it.